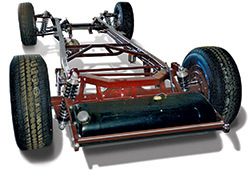 The Heinzman Street Rod Shop offers an unique way to speed up your street rod or classic truck project. 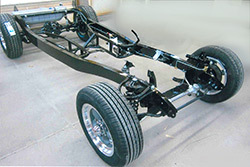 Trade in your original frame for a ready-to-roll street rod chassis! 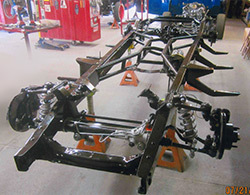 We can take your sound original frame, media blast it, check that it’s straight, make any repairs,even paint it if you want. The center X-memeber is modified for modern transmissions. Please call for details. • An original frame sandblasted, repaired and primed. We can use your frame or one of our cores. 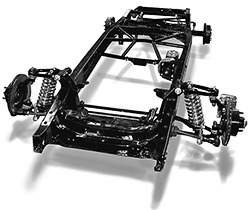 Options include Heidts Superide II front suspension with coil-overs, tubular A-arms,Wilwood disc brakes, Rear 4-bar suspension with coil-overs, master cylinder/booster, brake/fuel lines, gas tank, body work and paint, new rear ends and almost anything you would need to get your car or truck on the road faster. 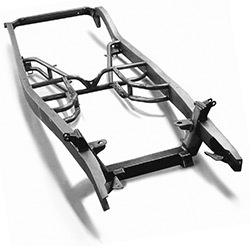 New reproduction frames-chassis packages are also availabe. 1305 North "C" Road, Phillips, NE 68865 • 402-886-2275 • fax: 402-886-2998 • © 2019 Heinzman Street Rod Shop. All rights reserved.